Chocolate Labradors are becoming more popular in America and finding a breeder of good and excellent quality puppies or adult dogs can be hard to find. Some breeders are breeding them for the color only and not for the betterment of the breed and breeding to the standard. Lots of chocolates are hyper and not a ideal Labrador for a family as a companion dog. It took over two years of searching for the right Chocolate for this kennel.... 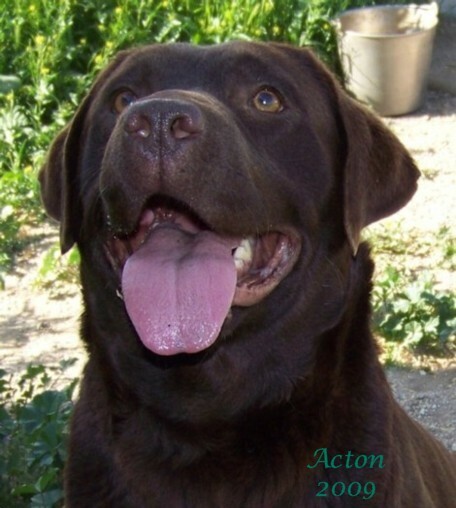 But now at Servant you will find beautiful chocolate Labrador and her name is Acton. She's mainly from English champion show lines with good temperament and not hyper.... The breeding program of Servant breed mainly for the families and most families like a mellow Labrador to serve them as a companion dog. The Chocolate Labradors can be a light shade of chocolate or dark chocolate. There are only three recognized colors of Labrador Retrievers with AKC and they are black, yellow, and chocolate. "The most distinguishing characteristics of the Labrador Retriever are its short, dense, weather resistant coat; an "otter" tail; a clean-cut head with broad back skull and moderate stop; powerful jaws; and its "kind," friendly eyes, expressing character, intelligence and good temperament. Above all, a Labrador Retriever must be well balanced, enabling it to move in the show ring or work in the field with little or no effort. The typical Labrador possesses style and quality without over refinement, and substance without lumber or cloudiness. The Labrador is bred primarily as a working gun dog; structure and soundness are of great importance." "Home of the Labrador Retrievers"